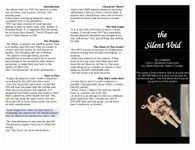 "the Silent Void" (or "tSV" for short) is a ruleslite, dice-less, play-by-post, survival, role playing game. Pretty much everything needed to play is contained with in this pamphlet. one(1) Game Master or GM.